Just over five years ago today this review first appeared on the blog. Seemed like a good time to run Barry’s 2014 review again. Make sure you head over to Patti’s blog for the full list of reading suggestions for this first day of February 2019. 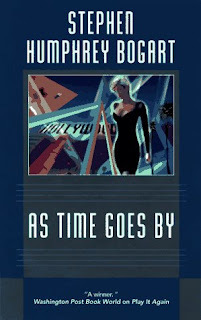 Reveling in the energy New York City generates and contemptuous of the L.A./Hollywood atmosphere he grew up in and happily departed, R.J. Brooks now plies his trade as a private detective specializing in the kind of keyhole-peeping matrimonial cases that give private detectives a bad name. His deceased parents were actors, the stuff of Hollywood legends who are still revered for their dramatic skills as much as for their "star qualities," and who will always be remembered for, above all else, their performances in the iconic film "As Time Goes By." R.J., as he is continually referred to in the third-person narrative, is very enamored of one Casey Wingate, a New York-based TV producer. Normally a love'-em-and-leave-'em type, he's somewhat conflicted because he's never felt this way about any of the other women he's been involved with. While together on a dinner date, they're assailed by reporters wanting R.J.'s reaction to the news that a schlock Hollywood studio, Andromeda Pictures, has in production a sequel to "As Time Goes By." It's the first that R.J. has heard of it, and the information enrages him because the original "had been the picture his parents had been working on when they first met....The movie had turned his father from a star into the star. It had brought his mother, too, into the front rank of Hollywood starlets." When asked by a reporter for a comment, R.J. tells him and the others that he hopes the "animals responsible for this die a nasty death." The next day his photo is in all of the newspapers—along with his statement. When he learns that Andromeda's CEO, Janine Wright, is in New York for a stockholders meeting, and that she's staying at the Hotel Pierre. R.J. devises a ruse to get up to the Presidential Suite to confront her, and in the process meets Wright's lawyer, Murray Belcher, and her daughter Mary. The confrontation turns nasty but ultimately gets him nothing but exasperation and more anger. When Murray Belcher is murdered, R.J. is the prime suspect. But Belcher's is only the first murder. All of the victims are associated with Janine Wright and the sequel, and in nearly every instance, R.J. is in the vicinity. Complicating matters is Casey, who takes a job with Andromeda Studios as an associate producer. The fact that she'll be going to California is bad enough. 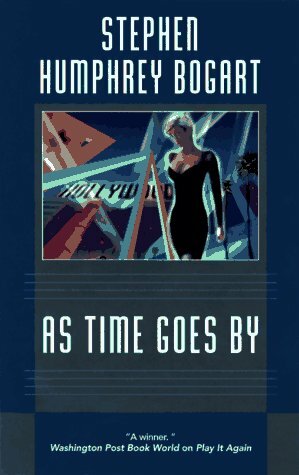 That she'll be working on the "As Time Goes By" sequel is like a knife in R.J.'s gut. In spite of this, he wants to be there to protect her from the unknown murderer. To further add to the chaos, he's hired by Janine Wright's daughter to find her father, who has recently been released from prison after serving time for dealing drugs. Mary is convinced her mother framed her father. Stephen Bogart, of course, is the son of Humphrey Bogart and Lauren Bacall, and so has first-hand knowledge of Hollywood and its denizens. Even so, many of the characters are definitely stereotypes. The novel generally moves along at a nice pace, but there are passages in which R.J. agonizes a little longer than necessary about his feelings for Casey and their relationship, and which I felt slowed things unnecessarily. 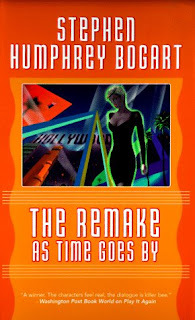 My copy of The Remake: As Time Goes By was an advanced uncorrected proof, so it's possible some of the nits I'm about to pick didn't make it into the hardcover and paperback editions intended for public consumption. R.J. Brooks is the viewpoint character in the novel, through whose actions, eyes, thoughts and feelings the reader experiences events. There are a great many passages throughout in which he's the only character in action. But instead of referring to him via the pronouns he and him, Bogart too often (for my taste, anyway) refers to him as R.J.
it bothered you it might have been different—"
"Casey, you were there. You heard what I said." "To me, R.J. You never said anything to me." "I'm saying it now, Casey." "Now is a little late, R.J."
In my experience, two people who know each other, whether casually or intimately, don't call each other by name like that in conversation, so I found it rather grating. 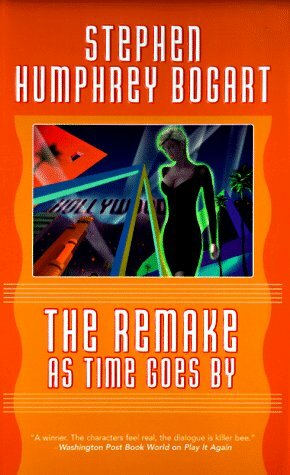 My complaints notwithstanding, The Remake: As Time Goes By, though hardly the peak of hardboiled detective fiction, is an entertaining novel that will most likely satisfy fans of the genre even if it doesn't knock them out of their socks. It does contain its share of raw street language, so easily-offended readers are advised to stay away. Some of Derringer Award-winner Barry Ergang’s work can be found at Smashwords (some freebies here) and Amazon. No way I could resist reading this review! Seems like I heard of this book long ago, but somehow let it slip away. Now I'm ready to...er, try it again. Thanks, Sam! His first one, Play It Again, was better.